One time or another, you might have a sent a message to wrong person on Facebook. That wrongly sent message could be a simple “Hi” or an embarassing picture or an NSFW meme. This gets worse if it was group chat. Once sent, there is nothing you could do other than hoping the person on the other side would magically miss the message or better quit Facebook. You can now undo a message you mistakenly sent a message a wrong person on Facebook and avoid embarassment & awkwardness. If you don’t know already, there was major news around April, 2018 that Facebook deleted Mark Zuckerberg’s messages from the recipient’s inbox. They unsent all of the Mark Zuckerberg’s old messages he sent prior to 2014, an option which wasn’t available to users. Since then Facebook started working on this “Unsend” feature as the users started demanding the feature and they finally released it to all users globally after about 10 months. 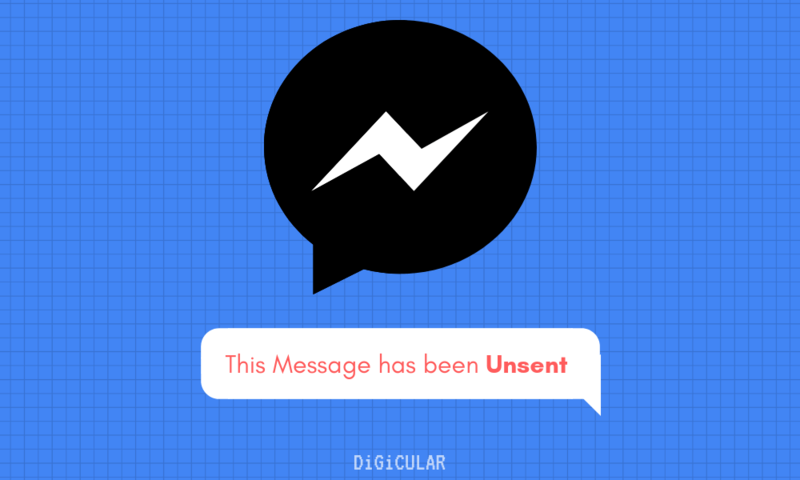 What is the Facebook Messenger’s Unsend feature? Facebook Unsend feature is similar to that of WhatsApp’s. If you accidentally sent some wrong/ embarrassing message to someone and want to undo it, you can do so by deleting it from both your and recipient’s phone using this option. The option usually labeled as “Delete for everyone”. But the key difference between Messenger and WhatsApp’s unsend feature is the Time. In WhatsApp, you can unsend a message until about 68mins after sending it. But, in Messenger, it is only 10mins. Let’s see how you can Undo/ Unsend a message on Facebook Messenger both on the mobile app and on Website. 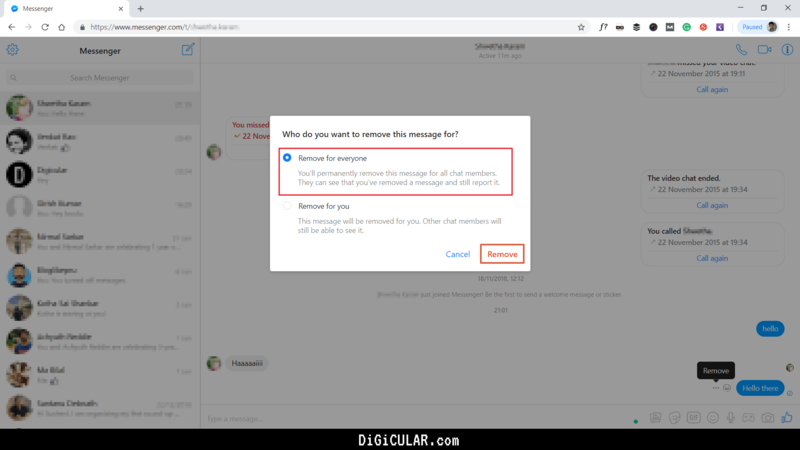 How to Unsend a Message on Messenger Android/ iOS apps? Tap on Remove option and then tap on Remove for everyone option. 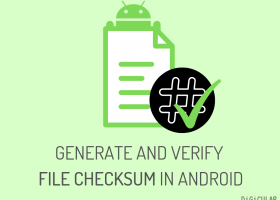 Now you will see a popup asking for confirmation, just tap on Remove. 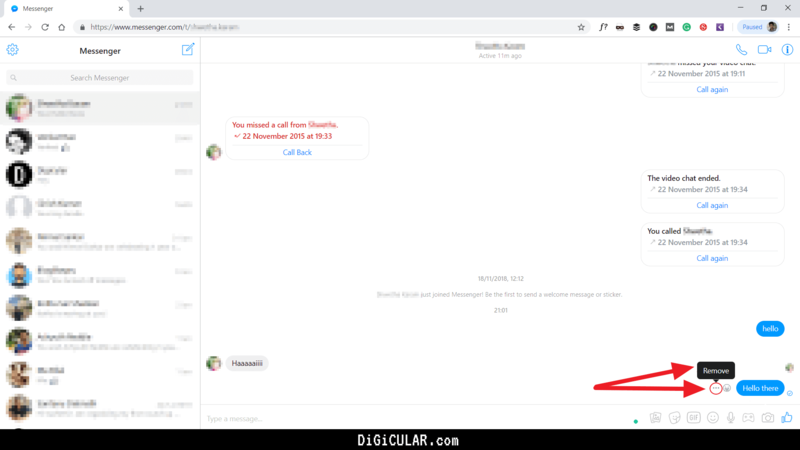 How to Un-send a Message on Messenger Web (Messenger.com)? Open Messenger, login and open the chat in which you want to remove a message. Place your mouse pointer on the message and you will see a 3-dot icon to the left the message. Click on that 3-dot icon and then click on Remove option. Now you will see a popup with 2 options Remove for Everyone and Remove for you. Select Remove for everyone option and click on Remove button. Q. How long before I can unsend a Message? 10 Minutes. You can delete a message for everyone up to 10 Mins after sending it. Q. Can I Unsend messages only on Messenger app or can I do it on Messenger.com too? You can unsend a message on both Android/ iOS apps and also on the Messenger/ Facebook website. Q. Can the recipient(s) see that I have deleted the message? Yes, they can. Similar to WhatsApp they can see a message “YOURNAME removed a message” in the place of the original message. Q. Can I unsend a message in a Group chat? Q. What kind of messages can I unsend? You can unsend Text, Picture, Video, Audio, Sticker or any kind of messages. Concluding: So how useful is Unsend option for you? 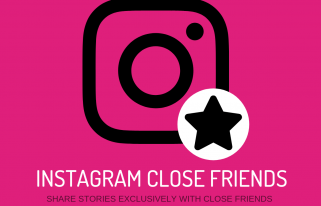 I had been waiting for this feature for a long time (I bet you did too), given that WhatsApp and Instagram already have it. But just as it did with Secret Conversations, an End-to-End encrypted chat feature, Facebook finally released Unsend feature after adding it to WhatsApp first. The only downside you might see here is the 10 mins time-limit for deleting, while WhatsApp & Instagram has a very high time limit. But, I think it is a fair time for anyone who did accidentally sent a wrong message and wants to undo it. What do you think? Let me know on Facebook or Twitter.